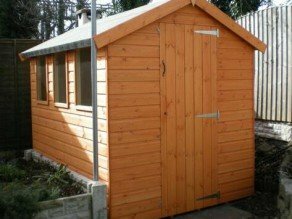 Regency Timber Buildings prides itself on top quality wooden garden sheds and buildings at great prices with quality specifications. 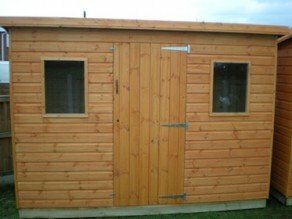 Our storage sheds are made using ex-125x16mm Redwood T&G Shiplap(13mm finish). The vertical framework is a superb 2×1½ inches, far stronger than most other shed companies, the framework is fixed together with corrugated fasteners and then screwed for additional strength. We use rust resistant nails in construction of our garden sheds and the cladding is treated with a top quality brush on cuprinol ultimate preservative in a choice of 6 colours, not an undercoat or pre- treatment like many others. We do not use shed grade felt like almost all other manufacturers to penny pinch, we use a good quality 3mm thick garage grade roofing felt. You can forget sagging roofs too, we use larger timbers in our roofs than the average shed (4x2cls) and roof trusses in our larger sheds. This prevents the common problem of sagging roofs, which leads to the shed roof felt failing and leaking. All our wooden garden sheds, large sheds, and storage sheds are really easy to assemble because of the way we have designed them, all you need is a solid level base, And a spare couple of hours to erect one. The doors are pre-hung and the windows are installed and sealed to make installation a breeze. Please note we do not use pins to hold the glass in like you see on a lot of sheds, we use architrave and beads then silicone seal the glass in. All dimensions are nominal before machining. Another benefit of Regency’s Timber Garden Sheds and Storage Buildings is the number of sizes available. If the size of shed you want is not on our list we will be happy to make it at no extra cost. You can add any extras on that you need. Compare that with the ‘Big boys’ who say you can have that size, that size and that’s your lot! They are a hand made with a lot of care at every stage from design to build to assembly. Please call 01948 830460 or email if you need a different size or different specifications.